Featured and fated to impending repeat on the show Canada Over the Edge, the Bay of Fundy has had it’s fair share of TV exposure. A destination I’ve always wanted to explore, our latest trip to New Brunswick had us venture out to the highest tides in the world (14 metres or 46 feet to be exact). A finalist in the “New 7 Wonders of Nature” competition, this natural phenomenon holds dear to many a Canadian’s heart. 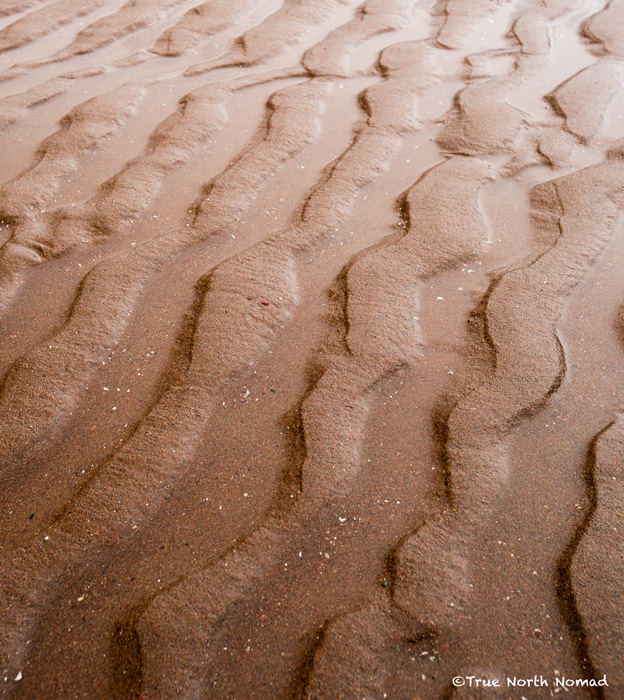 If truth be told, and why blog if you’re not going to tell the truth, my first walk on the mudflats of the ocean floor had my palms a bit clammy. I’ve heard many stories of oblivious tourists becoming trapped off shore as the Atlantic crept in behind them, seeping to the lower levels of the bay from where the poor sap stood. And if we’re still being honest, I made sure to keep my distance (about 30 feet) from the edge of the waterline to ensure the ocean didn’t gobble me up. So imagine how much of a twit I felt like when a local told us how it takes approximately 6 hours for the tide to go out, 6 hours for the tide to come in. Apparently, as long as I was aware of my surroundings I could outrun the “rushing” tide of the bay. I know… I’m a wimp and easily spooked by tales. My only redemption was that the lady did confirm people need to be saved from the water all the time. All the time being relative I’m sure. But see…. there was weight to my fear. In any event, Q and I checked out some of the show’s featured locations while visiting New Brunswick this past July. 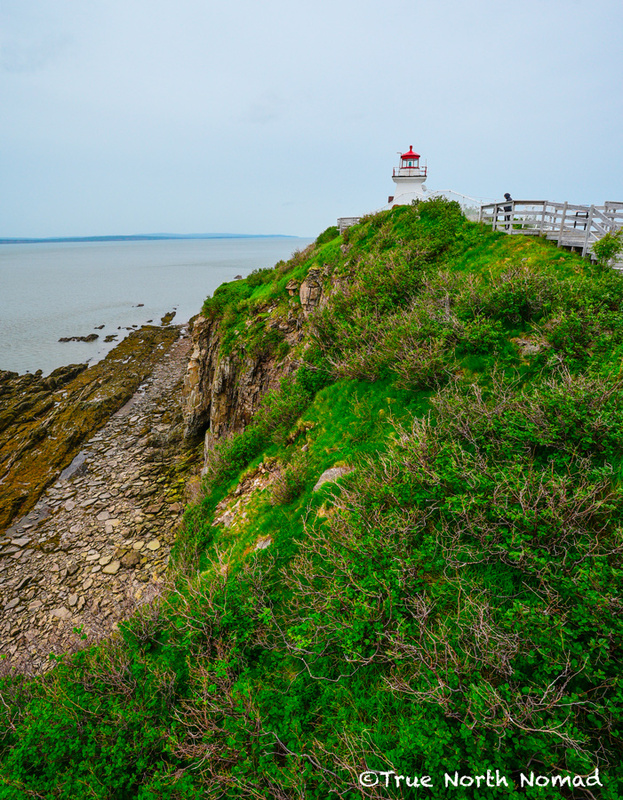 Here are three must see of the Bay of Fundy. Don’t expect a bustling town. In fact don’t expect a quality highway leading to Waterside. Actually don’t even expect too many signs telling you how to get there or that you’ve arrived. 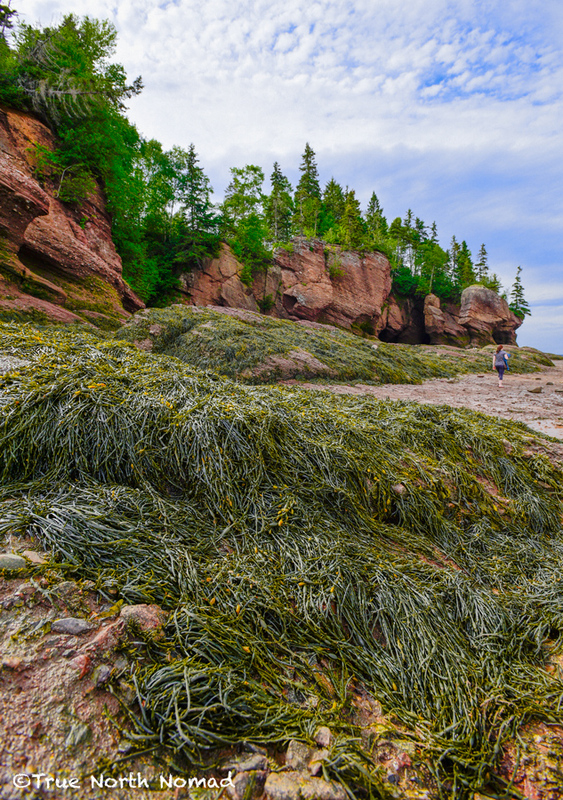 I found some of New Brunswick’s attractions kind of like “Where’s Waldo”?. They give you a hint here, a hot or cold there and then after a few pot holes you’re on your own. Ok, I’m getting off topic. Situated above the bay close to the town of Alma sits Waterside. With around 100 residents don’t blink or you might actually miss the community. What you won’t miss though are the mudflats at low tide. Although there was no sign that I saw of that indicated we were there, I recognized the beach from the show once staring down at it. It’s hard to miss. A small parking lot at the head of a trail leads you down to the beach and to the ocean floor. Even though it was cold and rainy the day we were there it was still very tranquil and beautiful. It’s the same road that leads from Waterside to Cape Enrage. Again don’t expect unblemished pavement or signs leading all the way. We had no idea if we were on the right path or not. We found the same perplexed expression on tourists we met trying to make their way to this famous lighthouse. (If you reach the man-made beach of rocks, creating a land bridge to what appears to be the other side of a little inlet, then you’re on the right path my friend.) The scenery getting to Cape Enrage is exceptional, which caused us to take pause and of course photograph wherever we could. A small fee grants you admission to the location which consists of a restaurant, interpretive centre and gift shop. Adventure abounds for those brave or foolhardy enough to attempt to scale or repel the cliffs or zip line high above the grounds. 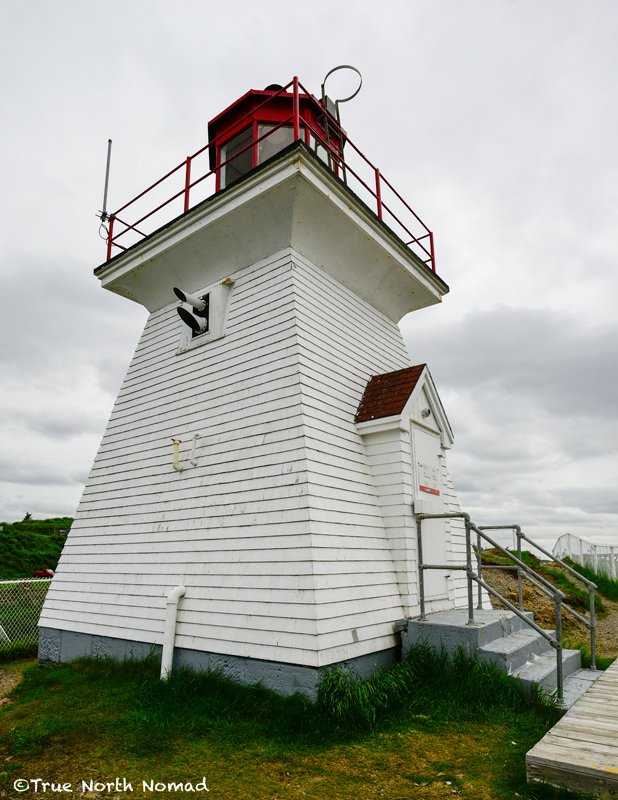 Fees and donations maintain the lighthouse and property and keep the operation self-sufficient. Oh and although I don’t remember her name, our guide at the interpretive centre was awesome. Entertaining with fantastic stories about the lighthouse’s history, the Maritime and sailing the seas. 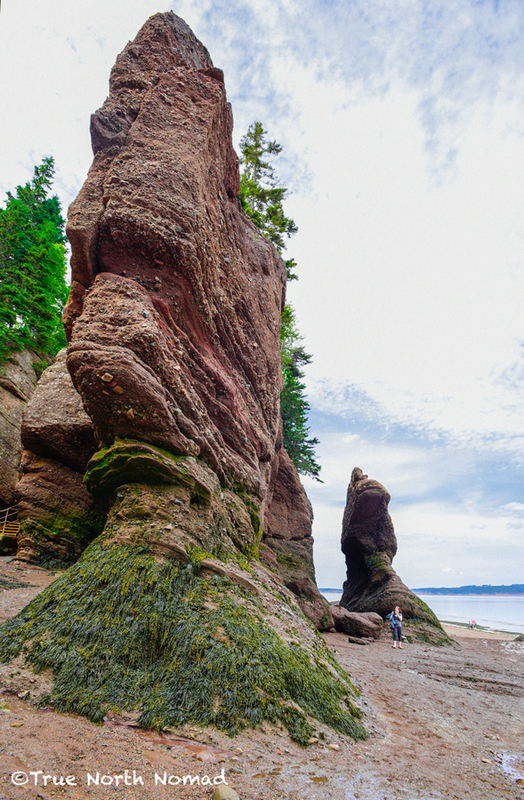 There is no way you can talk about the Bay of Fundy and not mention Hopewell Rocks. It is the face of the bay and the Flowerpot Rocks probably the most recognizable landmark in New Brunswick. Pets are welcome so don’t leave Fido in the car… which is a no-no any way. For a small fee, take yourself and the pooch and hike down the trails and walk the ocean floor. Yes down. The park entrance is high above the seabed. And if you are too lazy like I was to walk back up, there is a shuttle you can jump on for $2. The guy we had drove like a maniac which had our ride bordering on amusement park level! An interpretive/learning centre greets visitors at the entrance and contains interesting tidbits about the geology and oceanography of the area. There is a restaurant and gift shop in the main building and a canteen down closer to the beach area. For kicks and grins, come back later in the day or the next even(as your admission pass is good for two days just like Cape Enrage) and kayak 25 feet above where you stood only mere hours earlier. All three destinations are located between Alma and Moncton, town to town just over an hours drive. Although you will need to give yourself some extra time due to the road conditions it is possible to visit all three attractions in a day or two (depending on what activities you decide to engage in). Oh and if we’re still on the art of being truthful? If you happen to see a new docu-series about the Bay of Fundy and a crazy woman running frantically from the tide flashes across your screen? Yep, that’s me! 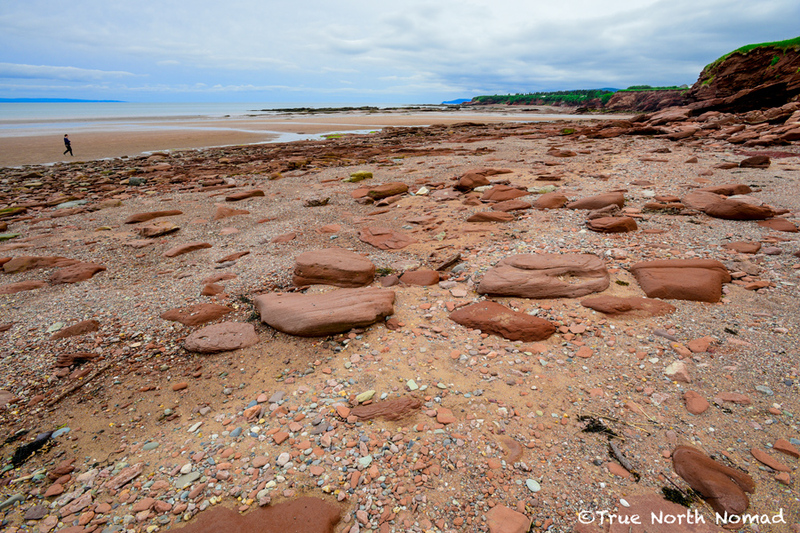 Do you think the Bay of Fundy should have won a place among the “New 7 Wonders of the World”? Is there another Canadian destination you feel should have been nominated? FOLLOW THE TRUE NORTH NOMAD… Top left, or bottom right or bottom centre of this post… yeah you found it. Enter your email address and click follow and never miss an impassioned tale again! 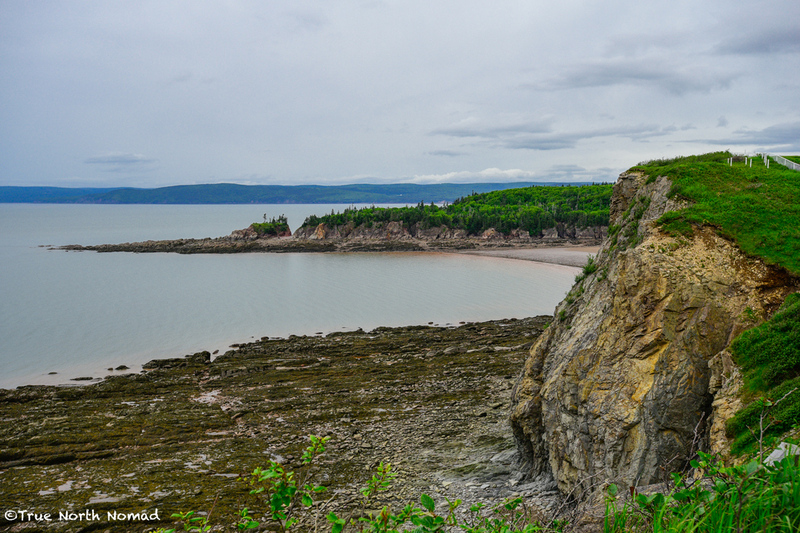 Hopewell Rock in New Brunswick is one of my favorite spots in New Brunswick. We lived in Riverview for awhile and spent many Sunday afternoons strolling along the mud flats of the Petitcodiac River. I can’t believe there is a shuttle now!! There in deed is a shuttle! All of New Brunswick is so beautiful but yes the coastline is spectacular! Thanks for dropping by! Thank you so much! Yes it is an unusual albeit beautiful lighthouse! Thanks for dropping by. 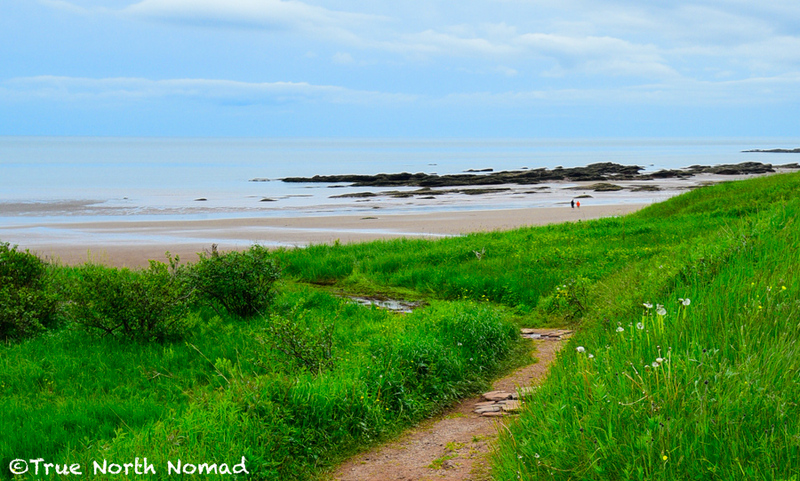 Yes Fundy is a beautiful park. I wrote about it back in July and how wonderful it is. I was just there and can’t wait to go back. 😀. Thanks for dropping by. Gorgeous photos and love the writing. Thank you – much appreciated! My Uncle was ‘babysitting’ my brothers. He took his car out to the beach on the Bay of Fundy and drank rum until he passed out. As the tide came in, a farmer pulled the car off the beach. My brothers thought it was the best day that they ever had. My parents? Not so much. Wow! I guess not. Lol. Thanks for stopping by. I believe the Bay of Fundy should win a place for the 7 new wonders. Ive never seen the mudflats before but they sound beautiful. As well as the fact that you can walk along the beach and then go kayaking right above the same spot you were standing just moments before. 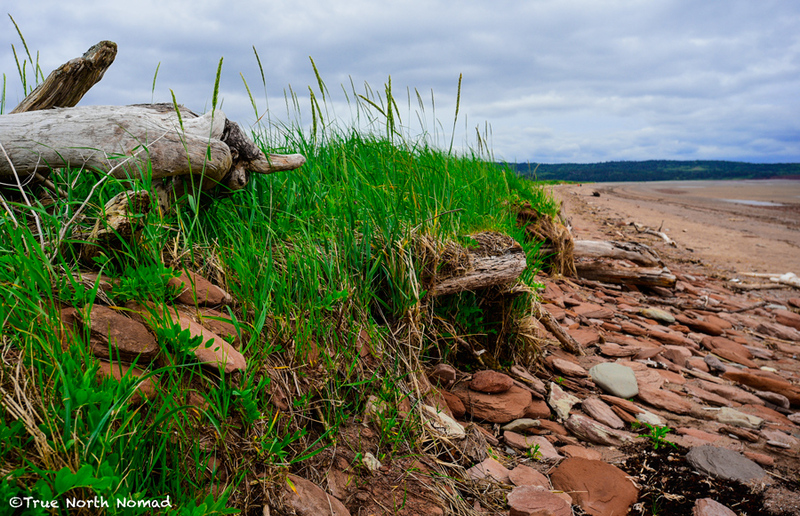 yes it is beautiful – and there is no where else in the world like the Bay of Fundy!